PATHWAY OF PEACE: "LEAVE EVERYTHING BEHIND"
LEAVE EVERYTHING BEHIND - "The Winds of Change"
etfirstcontact@et.treeofthegoldenlight.com] LEAVE EVERYTHING BEHIND - A MESSAGE FROM LORD ASHTAR - THROUGH ELIZABETH TRUTWIN - 13 OCTOBER 2013. Greetings this is Lord Ashtar. As you enter the powerful energies this week I invite you to leave everything behind. We are leaving the Hologram Earth and moving into the Real World. The past years have reminded us that changes need to happen, that this kind of life is no longer bearing fruit or peaceful. We will be reminded once again that we can no longer live lives where our own Collective Highest Good is ignored. Consider contemplating this statement of Higher Truth. In the days to come, as you slide gently into Ascended Earth you will leave behind everything you know about your life now. Do you feel resistance to that statement? Are you feeling you may not be ready? Maybe that you will be losing something? By contemplating your feelings about this you may notice that all that is bothering you are just thoughts. Remember, nothing in this realm is real. What should you leave behind? The Illusion. There are many who consider themselves Lightworkers who still believe President Obama is a puppet and controlled by others. There are many who consider themselves Lightworkers who believe the dark are still in charge. Ego mind loves to take up positions. Ego mind validates its existence by doing this. You are not your Ego. You are not your Body. You are Pure Love, Pure Consciousness. There is no dark force in charge of you or your world. Ego is incredibly stubborn and likes to be right. The negativity of these beliefs hold one in constant outrage, hurt, anger, pain, addiction and suffering. Gratitude shrinks ego. It is time to dissolve Ego Mind. Gratitude is focused on what is good. When you are grateful the Universe brings more to be Grateful For. Focus only on what is Light and the Universe brings more Light. I invite you to stop scanning the news together in a ‘prove it to me’ attitude. As a Collective Consciousness this group has been getting gratification from looking at news articles together. That is understandable considering that 99% of what is posted is a complete manipulation for Ego Mind ‘to be right.’ Ego Mind clings to who is doing what and clues which appear significant. Let it go! It is an Illusion, a Hologram. I invite you to leave behind scanning the news. Those who know what is going on cannot speak about it. You will not hear from anyone BEFORE Announcements what you WANT TO HEAR. There are other things for you to tackle now. Accept that THIS IS DONE. Instead have Faith to Trust that which you cannot see yet. Set your Intention to be Faith Filled. By focusing on the news it keeps you woefully unaware of what is Real. Earth now is in the midst of a violent storm. It is manifesting itself in the physical with Typhoons, Tornados, Cyclones and Earthquakes. The winds of change are blowing through. Mother Earth made a clarion call in 1987 which lead to Harmonic Convergence and the reversal of her destruction. Now we see the economic structure which is built on destroying Earth must dissolve. It is not supported by Earth Ascension. The Galactic Federation as well as the Intergalactic Confederation of Worlds have their Crews at Earth coordinating their assistance on every level to return Earth to Balance. October 13 marks the end of Nine Nights where millions of Hindus have been fasting and staying up all night in song and dance celebrating Divine Mother. President Obama is not unaware that this week could bring Global Economic Collapse as a result of Celebrating Divine Mother. We Celebrate Gaia, Mother Earth as we graduate out of the economic basis which was designed to destroy Her Rivers. Mountains, Oceans, Seas, Seed, Soil, Grasses, Trees and the Creatures who live there. This Global Economic Collapse is sandwiched between Navratri and a Full Moon Lunar Eclipse on October 18. True Love is expressed through this Blood Moon as it is called as we leave everything behind because it needs to be set free. We allow anything working against Earth to slide over to a new Realm where it may flourish. Let it go. Let the Illusion go. This Aries Eclipse brings the Fire Energy to baptize the Healings needed. Intend that as we enter this Eclipse All Things, within and without are healed. If you require a Healing today, Intend it Be Done. All imbalances on Earth are Healed this Libra Full Moon. The Fire of Aries makes this a most potent Energy capable of Balancing and Healing All. One of the very hard concepts to accept in this change is that many many will be leaving the Planet permanently. It may be as many as 2 Billion people. As you hear this news, allow it to bypass Ego and bypass any fear you may have and take it into the Heart. Earth’s Citizens have allowed themselves to ignore the Souls which they were powerless to help. Out of over 190 Countries on Earth there are wars being waged today in 60 Countries. Every year one and a half million people die from hunger. Around one hundred million people worldwide are homeless. Almost one million people are trafficked across borders everyday, always for forced labor of different kinds, half are children. There is a potential for 2 Billion Souls to move away from their lives on Earth and onto other Realms in our Multidimensional World which will better serve their Soul Growth at this time. In the Indian Vedic Text called the Mahabharata these Ones were called the walking dead. They lived their lives to underscore suffering on Earth. By doing so they helped every Soul mobilize for Ascension. They have cleared their karma by taking on this role of great suffering. They agreed before they incarnated that they would have a new assignment in a new place when Earth Ascends. In the very next moment as Earth Citizens end all wars, destroy all nukes and welcome the Galactics back to Earth then Divine Government with a new Economic System slide right into place for all on Earth. What can we expect then? Free Energy, Replicators and Healing Machines. These will be top priority. Homes for the Homeless, Clean Water and Communication Technologies. Shuttle Craft to fly to the Light Cities. There will be little boxes, the size of a shoe box which will be able to power your entire house for free. These are manufactured and available and will be given out free to everyone. Taking Free Energy will not be mandatory. All of the old appliances and different forms of energy will be supported. Whatever appliances you have today will work with the little boxes. Immediately you will have free heat, electricity, hot water, phones, television broadcasting and internet. Free for All. Replicators will be given out free. These will be able to replicate healthy food. Free Food. Immediately. You may replicate any food or dish you desire. Our technologies will be able to clear all the pollution in every Body of Water on Earth. Water supplies will be made ready where there is none. We have the power, Ships, supplies and people already in place to carry out these missions immediately. A network of communication is already in place and will be activated immediately. Everyone on Earth, no matter where they are or their mode of communication will receive all updates equally around the world. Some Countries have never had internet until very recently and this was brought in on purpose to be ready for changeover. Shuttle Craft are available for distribution immediately. These will be used to attend gatherings in the Light Cities. Also they will be used to leave Earth and visit various places. More information to follow. As these minor details are worked out we are able to move on to the Real World. Love and Truth aligned Consciousness will permeate every cell on Earth. Grace is revealed. Having surrendered everything you knew before, I present to you the Real World. I invite you to Celebrate every moment of your life with childlike wonder. Enter your Shuttle Craft. Input into the GPS onboard your destination. I invite you to visit us at our Space Stations which float within Earth’s atmosphere. These Space Stations have been here all along. In this present era they were not revealed to you. Galactic Crew move through these Stations like a train station. Crew come into the Stations to make connections with other Crews. Lodging, Meeting Places, Holiday Accommodations and Administration for the Galactic Federation are found here. You are a part of the Crew. You are welcome anytime. I invite you to visit us in the Light Cities which will be hovering just above Earth. Here you will find your mentors, heal psychological and health issues. You will have training for the new technology. You will have connections with like minded people all over the world. You will have access to rest and relaxation on levels you cannot now comprehend. You will reconnect with light and sound frequencies through many different medium. Earth Citizens will begin to contemplate their Next Mission. Until the healings are completed the Missions cannot be comprehended. Reunions. Every person on Earth will receive two or three mentors to help make sense of the changes. Each person’s mentors will be someone they have known before. Some have prepared to be reunited with their Twin Flames immediately. Others will be met with family members or friends who had passed on and have rehabilitated, ascended and returned for reunions to act as mentors. There is no need to have anxiety about meeting with your Twin Flame or other mentors. Everything is designed to be comfortable for you on every level. You will understand as it unfolds. There will be two or three mentors for every person on Earth. There are billions of Galactics standing by from the Intergalactic Confederation of Worlds who have been preparing for this moment for a very long time. All of the support which will be needed to slide into change will be here living on Earth. Some Earth Citizens will feel the best way to heal is a visit to their Home. These Holidays off Earth will be granted. You will be welcomed to Venus, Jupiter, Saturn, Pluto, Neptune, Ceres, Vesta, Mars, Moon, Alpha Centari, Sirius, Pleiades, Arcturus, Andromeda and so many other places. Each of these places is very different and known for their specialty. There are as many reasons to visit as people wanting to go. After a short visit you will return to your duties on Earth involving establishing Divine Government and beginning New Earth. Holodecks will be available in the Light Cities. The Holodecks are a space a person enters which is programmed by a computer to virtually become anything. You may visit the beach, the mountains, an iceberg, a desert. Holograms may be programmed with any virtual experience where One may visit Home for a few hours without traveling there. There will be plenty of time made for rest and relaxation. This will be made available to anyone requesting it. Along with these healings and mentoring activities will be planning meetings for your New Mission. You will be Called to Duty to share your gifts and talents in building New Earth. It is about to become more fun. Some other activities we will all enjoy together will be cultural exchanges on Earth and off Planet. Also we will be welcoming many new species to Earth, both humanoid and those of the magical kind. Animals which have been extinct thousands of years will be reintroduced to Earth in the right conditions. The Great Teachers of Earth will be returning to help with this Earth Ascension Mission. Some who left Earth eons ago have been invited back to Guide and Serve. When they show up they will be wearing the garb of their culture and time on Earth. They will look like they did then. These are the Avatara forms of Great Teachers and they will be together at the same time living on Earth. 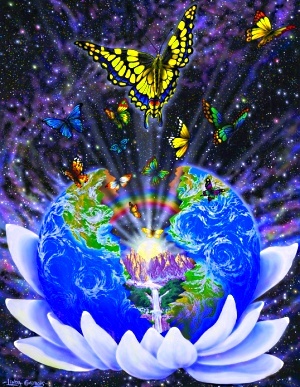 It will take all these Great Beings to accomplish all the changes to Earth. They are excited to return and do their Service on Earth. You will be seeing the Roman, Greek, Egyptian, Hindu, Far Asian, Hyperborean, Pangean, Celtic, Near Asian ancient Gods represented. All will be Ascended Masters here to integrate the Highest Teachings into the new economic system and Divine Government. There will be much to learn. It is a great honor to work with these Beings. Inner Earth dwellers will join surface Earth Citizens and invite them to their Cities at Inner Earth. There are Paths leading home to Inner Earth. Guides will take you into their cities there and host you for cultural exchanges. Inner and Outer Earth will become One in their Mission and all will be free travel between the two as has always been meant to be. This was a very important aspect of healing Atlantis. Inner Earth dwellers are overjoyed at the prospect of being welcome on the surface once more. They could not travel to the surface as long as there was war. A few have but they do not stay, they always return inside and have patiently waited for this reunion with their Earth counterparts. Many are wondering how their individual Ascension will play out. This is an exquisitely individual answer for each. Living on Earth now are some who are now in their only Earth life. Others have 3 - 5 lifetimes on Earth. Others have incarnated on Earth thousands and thousands of times. Similarly, there are a multitude of levels of understanding. Each person can expect to have two or three mentors. Each mentor will have their own expertise to share. These mentors will be in charge of arranging off Planet travel, holodeck training sessions, rest and relaxation, visits to the Cities of Light and Healings as is needed. No one will be making these appointments on their own. These mentors know you and you know them. Your Ascension Path has been mapped out for you. One of the first things you will experience is a full Soul review. From there your necessary trainings will be scheduled such as how to use a Replicator or how to fly your Shuttle Craft. As for your Mission you will have some suggestions based on your desires presented to you and you will be shown the training that would be necessary to move into the next work. This period will be similar to when children choose an Apprenticeship or University work. Some will know immediately what they want and will want nothing else. Others will need Soul searching to figure it out. As this process is experienced with the mentors then the Ascension Path will be worked on. Each person will be required to do all the necessary Inner Work for their own personal Ascension. There are no short cuts and nothing is a guarantee. Each One will be freely given all the help necessary and as long as they are doing their duty and working at no longer reacting, working on dissolving ego, then their Path will be smooth and straight. Your mentors are also assigned with the task of bringing in your gifts, such as levitation, teleportation, bending time, manifesting instantly to name just a few. Each new gift will be taught as the previous one is mastered. It is like learning to ride a bike, then drive a car, then fly a plane. You can learn them all and you will not learn them all at once.